You are here: Home / Ethnic Groups / The People of Sumatra / Who are the Ranau? The Ranau are a group who live near Lake Ranau in South Sumatra. They live in a few villages in South Ogan Komering Ulu regency, near Javanese, Daya, Komering and Chinese people who have lived in the area for several generations and mixed with the rest of the population. Linguistically, the Ranau speak a dialect of the Lampung Api language. They are able to understand the Komering, Daya and some other related languages. Ethnically, however, they identify with the Lampung Pesisir people, not with the Daya or Komering people. 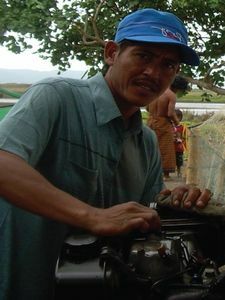 Some Ranau people are also able to speak the Palembang trade language fairly well. The Ranau people live in a beautiful mountain area made even more beautiful by their large lake. The name Ranau comes from the local word for “lake,” which then became the name for the people living around the lake. The lake is the center of the area. About once a year liquid sulfur comes out of the center of the lake bottom, causing many of the fish to become sick or die. There is a hot spring on one of the shores of the lake. The lake has been made into a tourist destination by the government. There is an unmaintained airfield nearby and several motels in the area. The Ranau area is very fertile, and the large tracts of forest help the area maintain a natural feeling. The primary means of income among the Ranau is growing coffee and tobacco. There are many coffee plantations spread across the area. The Ranau often carry a keris (small knife), reflected by the proverb “your weapon is your clothing.” The keris is also called “dengasanak” which means older brother who protects. In a Ranau wedding, a keris is placed on a tray and is given by the groom to the bride, as a sign of his oath to protect her with all his strength. Due to the influence of other people groups in South Sumatra, most Ranau are Muslim. However, their form of Islam is more of a tradition passed down through the family rather than based on personal belief. As a result, it’s not strange to find many people who believe in superstitions and sacred objects and places, or who still practice magic arts. According to their beliefs, the number of children in a home needs to be an odd number in order to bring blessing to the home. Islam in Ranau is part of the Nahdatul Ulama group (Association of Muslim Scholars). But only a small number of the people are faithful in practicing their Islamic rituals. Even so, converting to another religion is strictly forbidden, even in cases of marriage to someone from another faith. Marriages have to be conducted according to Islamic custom. Ranau people are not allowed to follow other religions. Even the Islamic group Muhamadiyah is off limits for Ranau people. This is done in order to hold to the form of religion held by their ancestors. In the villages, most families experience cases of infant and child mortality, up to 50%. A family may have seven children with four of them not surviving. Some villages have infrastructure such as clinics with staff midwives, but better healthcare is a major need in the area.